It may be outlandish to even consider using the words Michael Bay and masterpiece in the same sentence to most critics and cinephiles, but the third "Transformers" flick is pretty much indeed that. I have always thought of the over-the-top, no holds barred, but often hilarious "Bad Boys II" as the epitome of everything Bay and in the R-rated realm it most definitely is, but in terms of pure action, excitement, and epically grand scale, "Transformers: Dark of the Moon" will go down as the biggest of them all. I love movies and everything about them, I enjoy a good indie drama or small, character driven comedy. I like a good, quality animated film and I especially enjoy broad comedies with ensemble casts and authentic adaptations but I am in no way a lover of film who is ever too good to dismiss the quality of fun. If he weren't trying it would be a completely different story, but it is apparent by the improvements from "Revenge of the Fallen" to this third entry that Bay really does try and that he truly does care about the story he is telling and I believe, genuinely wants to deliver a great film that the fans will enjoy. This isn't a film made for the crowds who will look at it and view it for what it is lacking in character development or even story structure. This is for the audiences who crave escapism and Bay is firing on all cylinders here. up to help the Autobots. No matter who you are, you cannot deny the visual magician that Bay is. He goes for the iconic moments, he creates these images that burn into your brain and he stages the most epic battle between good and evil that has likely ever been put to film. In the last hour of the film we watch as decepticons and autobots ravage and defend Chicago. Skyscrapers fall, cars are but little dead ants on the street from any of the robots view and as the ever-persistent Sam Witwicky and his friends in the military run through the streets doing their best to help the autobots win the war and stop the baddies from bringing Cybertron to earth we are stuck in a state of awe as an audience member. That final hour is really the bit that is Bay's masterpiece. He finally seems to meld that human and machine element into one coherent story and connection, he captures real (not CGI) human beings dropping like flies out of an airplane so we see them soar through the rubble and into the heat of the disaster. The real complaint here is one that was the same with "Fallen" and that is the wish that Bay would have understood the storyline didn't have to be so convulted and prolonged. The audience is here for fun and excitement, you know that, why is it necessary to drown us with an hour and a half of exposition before you really get to what you want to do anyway? To get to that glory of that final battle we do get plenty of foreword, but never did I find myself bored or checking my watch. Sure, alot of it is unnecessary, but in a way it almost justifies paying extra for the 3-D and the Imax screening. Optimus Prime are reacquainted on Earth. The story is nowhere near as complicated as "Fallen" though and Bay enlists some rather credible actors to keep the story moving forward. John Malkovich gets to ham it up as an overly tan business man who hires Sam on for his first job and helps him to solve questions surrounding the mystery of the transformers history with earth. Frances McDormand pops up in a few scenes, fast-talking and super serious as some kind of government official. McDormand carries the perfect balance of artistic and sarcastic credibility to pull off this role perfectly (especially in the context of her presence in the film period). Then there is Patrick Dempsey who is ultimately playing what is no doubt some kind of version of Patrick Dempsey and though his character is probably better suited for a Friday night sitcom, one thing he does well is make the new girl look good. In a surprising twist Megan Fox's replacement (who, if you're wondering is dismissed with two lines "She broke up with me. I moved on to something better.") Rosie Huntington-Whiteley who plays Carly is actually much more appealing than Fox's Mikaela ever was. Whiteley may not be the next Oscar winning actress but she isn't anywhere near awful and the relationship her and Sam share seems much more affectionate than he and his previous lovers did. John Turturro, Tyrese, and Josh Duhamel are all back as well, but these characters don't add as much extra or unnecessary story here as they did in the second installment. And as for Shia, you gotta give this guy credit, he has acted opposite giant robots for three films now and he is just as sharp if not moreso than he has ever been. He seems to understand the essence of his character to the core here and he is nowhere near as whiny as he was in "Fallen". LaBeouf is likeable and charismatic in a way we never expected yet he brings a serious level of acting to a part most would dismiss as a joke. How easy is it to conjure up tears because you are about to watch your first car get killed? Not an easy task, but LaBeouf makes you feel it and that is something considering how ridiculous that previous sentence even sounds. Decepticons in "Transformers: Dark of the Moon". Bay has completed his trilogy with what might be the best out of them all. He listened, but never conformed. He improved on his previous films without losing sight of what he knows his target audience wants to see. And it is not a bad sign for America that there is a target audience for this kind of film. If I saw a "Transformers" movie when I was ten years old my mind would have been blown. The pure thrill that every frame of these films offer is breathtaking not to mention that opening sequence where the moon landing is re-enacted really hits home with you. I found myself marveling at what a prestigious and unimaginable honor it must be like to be one of a handful of human beings to ever set foot on another planet. 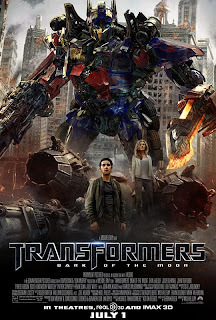 "Transformers: Dark of the Moon" may not be perfect and some will argue that it is so far from it they can't believe someone who claims to love movies so much would even think this way. But for a film about huge robots fighting other robots on Earth I'd say this is pretty close to the best kind of movie you could make given that premise. The fact that it is an enjoyable movie without having to apply that condition is a just a plus and an even bigger testament to how talented of a filmmaker Michael Bay truly is. Love him or hate him, the guy is a genius and I hope he continues to make big loud cinema while with every film learning something new and progressing and advancing his skill. There is no doubt he has it, I just want to witness all the places he will go with it.